Speaking from the White House on Friday in his final press conference of the year, President Barack Obama discussed alleged Russian hacks, recent developments in Syria, and the transition of power between himself and the president-elect before departing for Hawaii with his family for a two-week vacation. Before delving into questions on how Russian hacks may have affected the U.S. election and how Washington planned to respond, Obama kicked off his traditional end-of-the-year press conference by defending the achievements of his administration, including advancements in the economy and foreign policy. "Almost every country on earth sees America as stronger and more respected today than it was eight years ago," Obama said. 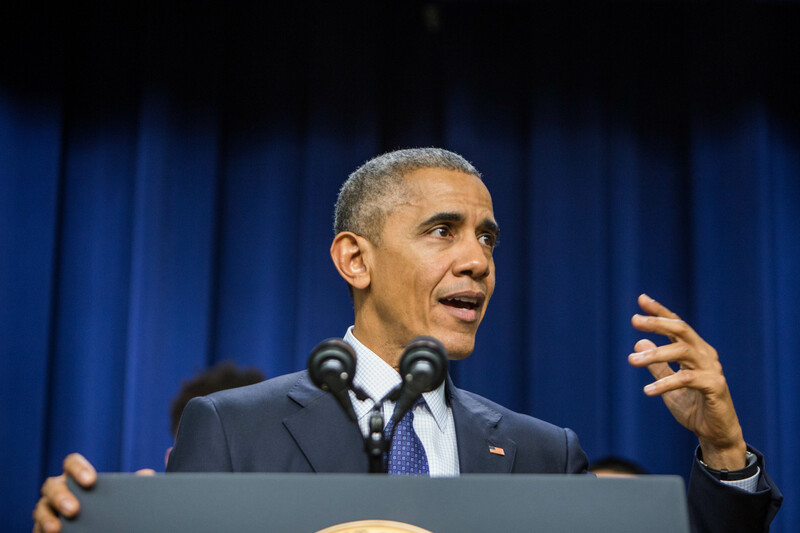 "By so many measures our country is stronger and more prosperous than it was when we started. It is a situation that I'm proud to leave for my successor." In defending some of his policies against those proposed by President-elect Donald Trump, Obama noted 670,000 people signed up for Obamacare on Dec. 15, representing the largest number of signups the health care reform law has ever seen in a single day, according to CNN. During his presidential campaign, Trump repeatedly vowed to "immediately repeal and replace Obamacare." While many of their policy views may differ, the president said he would continue to "make myself available" to the president-elect in an effort to ensure a smooth transition of power. The president said "uniform intelligence assessments" showed Russia was responsible for hacks on the Democratic National Committee (DNC) and stressed that matters of cybersecurity and potential foreign interference should be a bipartisan issue. "My hope is that the president-elect is going to similarly be concerned with making sure that we don't have a potential foreign influence in our election process," Obama said. "I don't think any American wants that. And that shouldn't be a source of an argument." Trump has expressed skepticism about reports of Russian hacks. Obama also defended the way the White House responded to reports Russia had hacked into the DNC prior to the U.S. election, saying they did not publicly delve into potential motives for the hack because they feared the "hyper-partisan atmosphere" surrounding the election would cause it to be viewed as taking sides. "Imagine if we had done the opposite, it would become immediately just one more political scrum," Obama said. "Part of the goal here was to make sure that we did not do the work of the leakers for them by raising more and more questions about the integrity of the election right before the election was taking place — at a time, by the way, when the president-elect himself was raising questions about the integrity of the election." In touching briefly on the situation in Syria, Obama said the regime of Syrian President Bashar al-Assad and its allies Russia and Iran were responsible for a series of "horrific violations of international law," including executing civilians and targeting hospitals and humanitarian workers. He said the United States would continue to push for full access to humanitarian aid, a broad ceasefire agreement, and a political rather than military solution. Obama and his family are expected to depart for Honolulu later in the day for the first family's annual holiday vacation.